We had a party over the labour day weekend and at some point during the evening there were about 15 kids of varying ages running around in our basement. At first I tried to provide appropriate toys for all of them but quickly gave up the effort. One little girl looked at the Play-Doh I gave her suspiciously and asked “Where are the Play-Doh toys?” Why do you need the themed toy accessories when its whole raison d’etre is to create something out of nothing? If I didn’t mumble something about “kids these days” under my breath, I definitely thought it. But then, an hour later when one kid started blowing bubbles outside, all the others big and small started to chase after them. It was a lovely sight. Sometimes the joys of simple games just can’t be replaced. When speaking of simple children’s games, I always think back to my childhood, playing gonggi (공기, pronounced goang-gi) with friends in the playground. Gonggi is a traditional game of skillfully tossing and catching small pebbles with one hand. At the very basic level, you throw a stone in the air and while it’s in the air, you pick up one stone from the ground and catch the tossed stone. Then at the next level, you throw another stone in the air but this time, you pick up two stones before catching the first stone, and so on, until you can pick up all the stones on the ground before you catch the tossed stone. The next level would have you throw two stones in the air and the same pattern follows. You can watch the short video demo above of a little girl who plays the level 1 game. 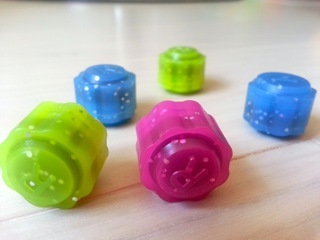 With nothing more than a flat surface and 5 little stones, this game can be played anywhere, any time, in groups or by yourself. Despite the simple set up, I can guarantee you that you would need to develop an advanced level of dexterity in order to master this game. 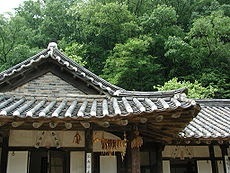 Growing up during and after the war in the 50s in Korea, my mom and her siblings recall finding little bits of a broken giwa roof (traditional tile roof), filing them against a rough surface to round out the sharp edges to play gonggi with them. Nowadays, in lieu of finding the right sized stones, kids would rather buy plastic stones like the ones in the picture above. But whether it’s the plastic stones instead of real pebbles, store-bought bubbles instead of a homemade version, I believe children’s innate ability to be amused by simple games should be cherished and fostered. After all, creative minds can create something out of nothing.